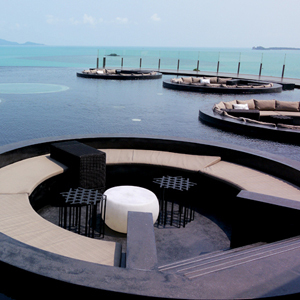 Arguably the most impacting entrance hall on the island, the W Lounge features a water lotus style pond perched on the edge of the horizon. It's the perfect spot to catch the sunset, read about from the library, or get connected to their integrated business center. Just don't get run over by the hordes of people looking to get a picture of themselves here… the lounge is a tourist attraction in itself. From Koh Samui Airport proceed 2 kilometers to the Big Buddha Pier junction. Turn left and continue approximately 5 kilometers to the Bophut junction traffic light (Ring Road). Turn right and follow approximately 2.5 kilometers to a signboard. Turn right onto the small road (next to Theeparat School). Travel 500 meters and the resort is located on your left.